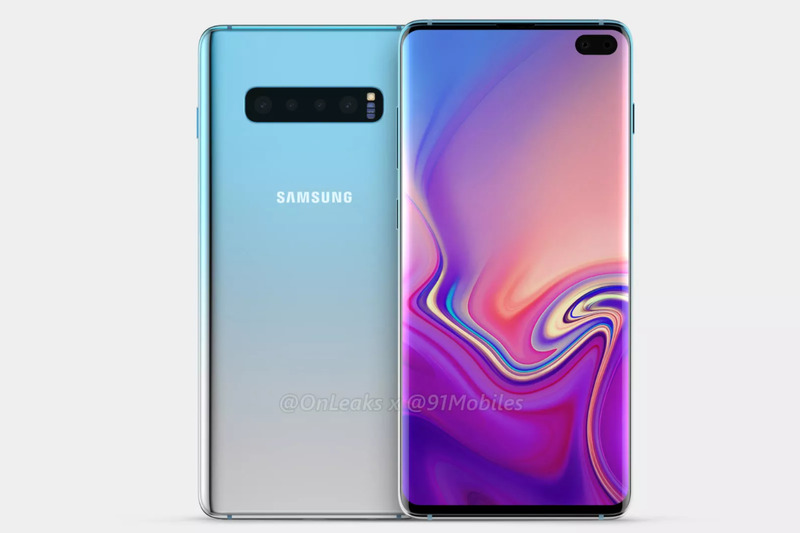 Samsung Galaxy S10 is expected to arrive with lot of improvement in design, recently we reported that the popular leakster Ice Universe has suggested that the upcoming novelty would feature dual secondary camera and would have a unique pill-shaped hole in the display to accommodate it. 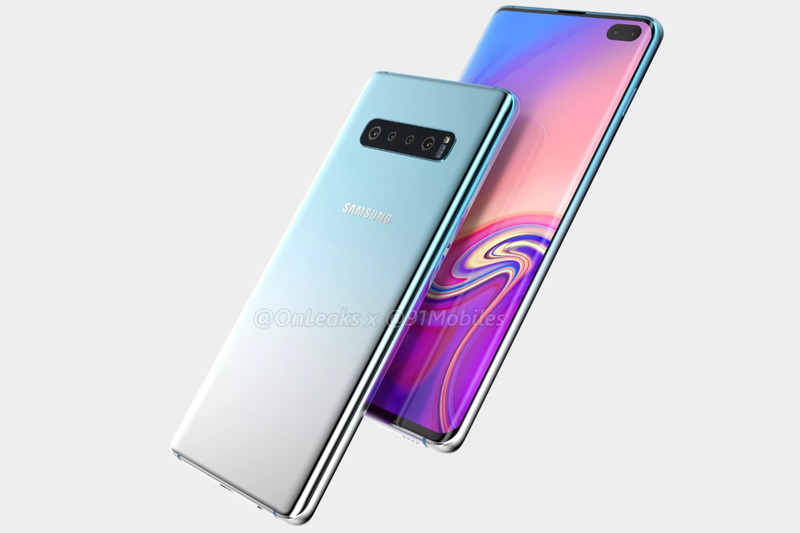 Now today the a new videos render of the Galaxy S10+ has been published by 91Mobiles and @OnLeaks revealing the design of the novelty for first time. From the renders it seems Galaxy S10+ would retain Samsung’s signature curved edge display while has manages to avoid notch by a pill-shaped display hole in the corner of the panel to accommodate two selfie cameras. Another significant change in the front panel seems to be that significant reduction in the top bezel while at the same time trimming down the side and bottom bezels for a increased screen to body ratio. Now talking about the rear panel design the primary camera module has now been updated to four camera design adding a third 16-megapixel camera with a wide-angle lens and an unspecified fourth sensor. The module will carry an all new 16-megapixel main sensor and a 13-megapixel telephoto camera. Samsung Galaxy S10+ would also include much awaited in-display solution while retaining the 3.5mm audio port. The ear piece has been moved to the top bezel whereas the usual button layout has been continued without any changes. 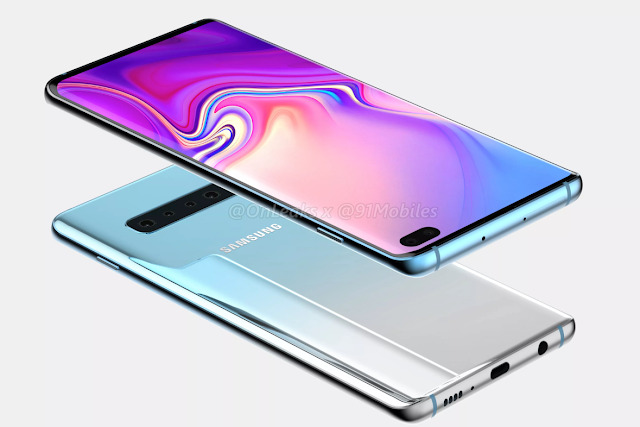 Apart from the new dual front camera the Samsung Galaxy S10+ is set to arive with a new 6.4-inch Infinity-O display that offers a very impressive 93.4% screen-to-body ratio and would be powered by either Qualcomm’s Snapdragon 8150 or the Exynos 9820, depending on the region. These new flagship chipsets will be more powerful and efficient than outgoing processors, thanks to the new 7-nanometer process. However, by combining this efficient chipsets with significantly larger 4,000mAh battery the Galaxy s10 would be able to provide better battery backup than the Galaxy S9+ which uses a 3,500mAh battery. According to the early reports, Samsung has planned three Galaxy S10 models for 2019 following the 2018 iPhone series. Out of the three Galaxy S10 models, two models will feature a curved edge panels while the more affordable model would feature a flat display.